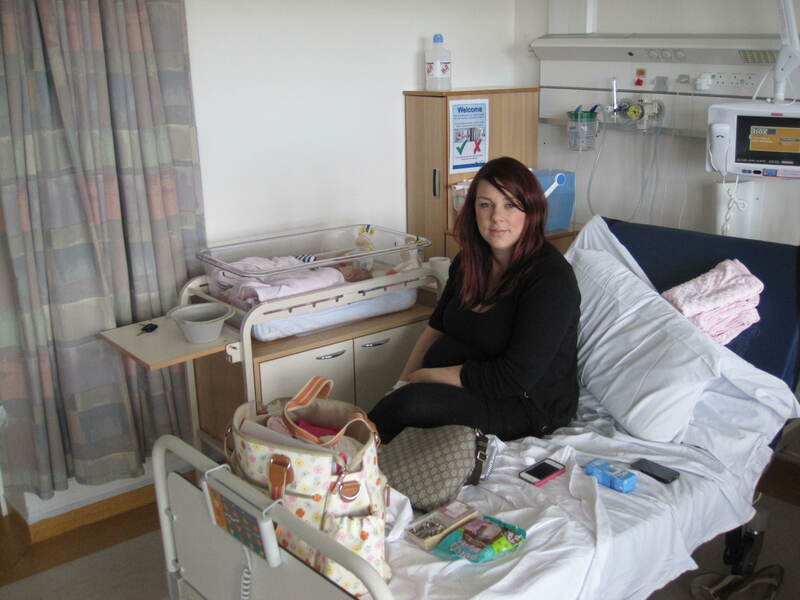 Before I went in to hospital on the day of my caesarean section I knew that I’d have to stay in for a night or two. I really don’t like hospitals; you could say I’m a little scared of them. They’re not the sort of place you really want to be in and normally you’re there for bad reasons. The thought of having to stay overnight really freaked me out. After my caesarean section I was brought down on to an extremely busy ward and I was given one of those fish tank-like cots for the girls to sleep in. I wasn’t asked if I wanted the girls to sleep together in the same cot, and they weren’t exactly small babies at the time of birth. We just got on with it and the girls seemed happy being cuddled up together. It must have been the NHS cutbacks, as twin newborns must share as there aren’t enough to go around. The first few hours where a bit of a blur as I was on a lot of painkillers and my new-found friend ‘morphine’. We only got a couple of hours alone together as a brand new little family before visiting families arrived. Visiting hours ended and I felt a sinking feeling. How was I going to look after these two tiny babies when I couldn’t move? I still had my catheter in and I was scared to move about much in case it hurt. My hubby gave his brand new daughters a kiss and then kissed me good bye. My eyes filled with tears as I held myself back and let him go. The midwives didn’t explain much of what I could and couldn’t do after my operation. My husband had been passing the girls to me from their cot and now he was gone. Anxiety started to sink in. How was I going to feed them? After about 40 minutes I rang the call button and a midwife came. I asked her what I should do when I need to feed the girls, and when I would be able to walk. She replied that I should call the button for assistance with feeding, until my catheter was removed. At one point during the night I was breast feeding both girls at the same time and couldn’t move for fear of dropping one. I was stuck and there wasn’t anyone around to help. I didn’t really like my time in hospital, though I was really lucky to meet a lovely lady who came in late on my first night. She had also had a c-section and this was her third child. Rachel was so lovely, kind and friendly, it was so nice to have someone to chat to during the night feeds. It was just what I needed, as she had more experience than me so I could ask her advice. I saw her as a motherly figure. On my third day in hospital the midwife made her rounds to assess who could go home. She checked over the babies, weighed them, and completed her observations. Unfortunately both of my girls had lost some of their birth weight. I had wanted to breast feed but on my second day another midwife had advised me to add extra bottle feeds as I could have to stay in longer because both girls were very sleepy and didn’t want to feed much. I had to wake them up every four hours to feed and it was extremely hard to keep them awake for very long. Lilly had lost 9% of her birth weight and because of this the midwife wanted me to stay in for a couple more days. I was devastated. All I wanted to do was to take my babies home and have some support from my husband. I hadn’t slept in three days and had barely eaten anything other than cold toast as I didn’t like the food. My baby blues must have kicked in, as I sat and cried for hours. The following day my friend Rachel was given the all clear to go home. As happy as I was for her, I was also gutted that I was losing my mate. I honestly think this is where my anxiety started. The night that Rachel left, my husband asked the midwifes if I could move to a different part of the ward, as I was having to leave the girls on their own and to walk to the other end of the ward to where the feeding room was to prepare their milk. I didn’t mind leaving the girls before as I knew they were safe with Rachel being across the bed from me. The midwife agreed to move me as it was a lot quieter on the ward. This was the worst mistake we could have made. The girls were all really nice and I even knew one from my NCT course. But two of them were having problems feeding and I’m not sure what was wrong with the other baby. They screamed all night from 10pm till about 5:30am. I felt so sorry for the one girl who was in a right state. Her baby was struggling latching on and starving. She had tried everything and was completely broken by morning. All this screaming through the night had tipped me over the edge. I became a woman on a mission! Crazed, I packed up all our belongings, got changed, and put the girlies in their going home outfits. I paced the corridor awaiting the arrival of the paediatrician, as the midwives had assured me that she would be making her rounds soon. We were the last babies to be seen at 4:00pm. The girls were weighed and to my delight they had both put on weight. But before I could take a sigh of relief the paediatrician explained that the girls were both slightly yellow and that they would need to be tested for jaundice. I felt that lump in my throat and the tears started rolling down my face. I knew if they had jaundice the girls could need treatment and we would not be going home. My husband tried to console me but it was no use. He explained to one of the midwives how desperate I was to get out of hospital. The midwife was lovely. She explained that if I was to stay in for the girls to have treatment that they would find me a private room and hubby could stay in with me. Why was this not offered before? I had heard that there were some women that had their husbands staying with them. The girls had their tests and we awaited the results anxiously, but luckily it turned out to only be a mild case and we could go home. The hospitals are understaffed and the midwives can’t offer the support that’s needed. If I could have done anything to change my hospital experience it would be insisting that I had my own room where my husband could stay with us to help out.